Tempo is an advanced training log and a beautiful visualizer for your runs to track progress, optimize recovery, and achieve your goals. With its incredible features and simplified details, Tempo is a powerful companion for the Apple Watch Workout app. 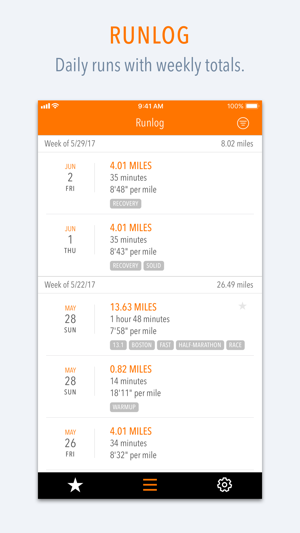 Thoughtfully built to be a simple running log with essential insights, Tempo is an effective training tool for every runner. Details matter. In Tempo, you can view every run with all the helpful details; see pace and heart rate on an interactive graph, view the route highlighted with splits on a map, and add your own notes for each run. We run for the joy, the distance, speed, endurance, fitness; all of it requires consistency. 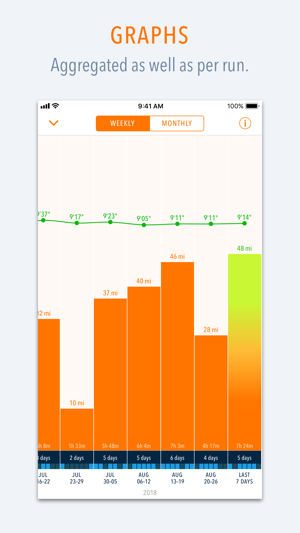 You can track your progress with week-to-week (and month-to-month) cumulative graph and averaging trends. Run, recover, and repeat - that’s how we achieve longevity and build strength. Tempo’s Intensity Log is perfect to monitor training strain and find your optimal stress cycles to improve. There are insights, there are graphs, we can tell you about the 3D Touch, or Today's widget, but it's not about a specific feature; it’s about you and your running. 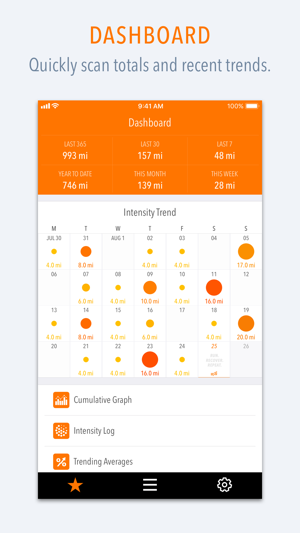 Tempo is designed to be your daily go-to running app. Your running visualized to delight you, motivate you, inspire you, and help you achieve your running goals. Tempo's pro features are only available with Tempo Premium subscription. If you choose to purchase Tempo Premium, subscription payment will be charged to your iTunes account. Your subscription will automatically renew unless canceled at least 24 hours before the end of the current period. Auto-renewal may be turned off at any time by going to your settings in the iTunes Store after purchase. Any unused portion of the free trial period, will be forfeited when you purchase a subscription. Current subscription price is $6.99 USD per year, and may vary from country to country. Tempo is here for the long haul. It's not a single sprint; it’s a marathon.. may be more than one :) We have a solid roadmap and we will keep building Tempo with your feedback and support. 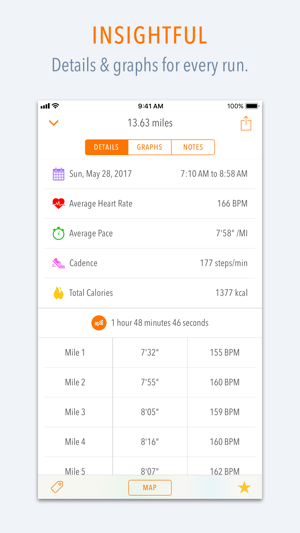 Tempo can only process runs recorded with your Apple Watch and the Workout app. 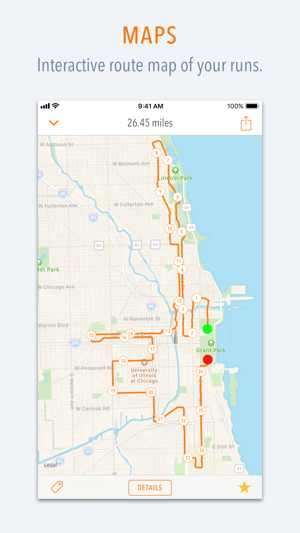 All your runs should be stored in the Health app. When you save a run in the Workout app, it is also saved in the Health app. Tempo does not support running data that is stored in the Health app from other 3rd party apps. We have tried, but unfortunately, most apps’ data is not fully compatible with Health app data format. We would love to hear from you. If you have questions or would like to share any feedback, comments, or running stories, please reach out. Hello. This is a minor release to support upcoming updates. There is one tiny, but very useful, addition – when data is available, we now have Total Climb (elevation gain) displayed on details screen of a run. Finally! This one took extra time to tune correctly and specifically to show split markers along the route. Hopefully we got most of the common scenarios working well. Filters now show total runs and distance for selected filters. 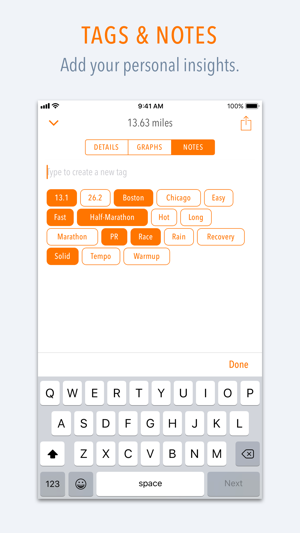 This is really useful for folks who like to track shoes with tags. New share action to privately share a run's splits or route map, or just save the screenshot. Tempo is not a social network, but we are all social in our own ways; and sometimes it’s really motivating to share a run with close friends and family for an extra high-five. If you have any questions or comments, please e-mail me at tempo@indie.sh or find me on twitter @TempoLog. Thank You & Keep Running! Just what I’ve been looking for. It takes the excellent data collected on the Apple Watch and puts it into an efficient and simple to use format. No social element. No large company using your data. Just all the things you need as a runner to improve. Thanks so much! Well done app - if you’re a runner and track your runs, get this! 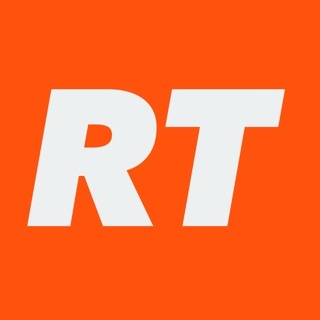 This app is simple and to-the-point. 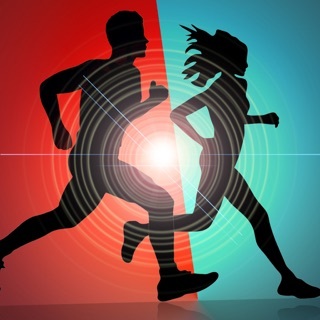 It automatically syncs run data from the built in health database and visualizes it more easily & meaningfully than the Health or Activity or running apps. Tempo has always had a beautiful and intuitive user interface. Version 2 has added an awesome amount of useful analysis. And it retains the usability and great design of previous versions. Updated: Now with maps. Still 5 stars!